DG Cajons was established in 2002, by Paolo De Gregorio. Working in the jazz-world music circuit, during the summer of 1998 Paolo was asked to join a Flamenco group, as a percussionist.It was then that he discovered the cajon, and following a deep research on the musical role of this instrument and its tonal prerogatives, he realised that this instrument had great potential, but at the same time, that it was really hard to find a good sounding instrument in the shops, and also, he was surprised by the lack of information about the tuitional and historical aspects regarding the cajon.After making a home made instrument for a child, everything fell into place, so he decided to start a production with a registered company, and DG Cajons was born.The company approach to work can be summarised in one phrase: Quality and Culture. This means that these manufacture products are made combining in equal measure craftmanship and technology within the highest standards of work ethics of the western world.The DG Cajon workers are highly motivated people whose rights are carefully respected, and also it is a reason of pride using an eco-friendly criteria when choosing building materials. 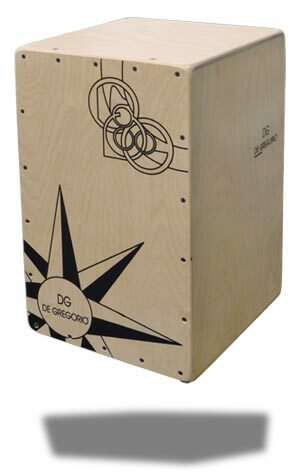 The world’s most renowned drummers and percussionists, like Stewart Copeland, Dave Weckl, Paquito Gonzalez, Marco Fadda, Hakim Ludin and Giovanni Hidalgo, play a DG cajon. Why not you?